Dungeness crab, reportedly named after a small fishing village on the Strait of Juan de Fuca in Washington state, have been harvested commercially along the Pacific Coast since the late 1800's. They range from central California to the Gulf of Alaska, and have long been part of the Northwest's seafood heritage. Dungeness crabs are caught in circular steel traps commonly called "pots." Weighing anywhere from 60 to 125 lbs. and measuring 36" to 48" across, each pot has a length of line with a buoy attached to mark its position for retrieval. The posts are baited with herring, squid and razor clams to attract the bottom-dwelling Dungeness crabs during the one-to-three day "soak" period. Dungeness crabs are kept alive in tanks until they are delivered to a shoreside processor. Only male Dungeness crabs measuring at least 6 1/4" across the shell may be harvested. Small males and all female Dungeness crabs are returned live to the sea. The average boat fishes 250 to 300 pots, in depths ranging from 5 to 30 fathoms (30 to 180 ft.) of water. Back on, cooked and frozen, 5-10% glaze, individually poly-bagged, size graded, 1.5-2lb, 2-2.5lb, 2.5-3lb, 3lb-up, (600g-900g, 900g-1.2Kg, 1.2-1.4Kg, 1.4Kg-up), packed 12 Dungeness crabs per box, shipped whole. Store at -10° to 20° F, (-24° to -30° C). Back off, cooked sections including body, legs and claws, frozen, 5%-10% glaze, and shipped approximately 20 pieces per 20 lb box, (10Kb box). Store at -10° to 20° F (-24° to -30° C). Thaw 48 hours in refrigerator and use as fresh. Maximum frozen shelf life 6-9 months. As a wholesale Dungeness Crab seafood supplier, we ship fresh frozen DungenessKing Crab worldwide! 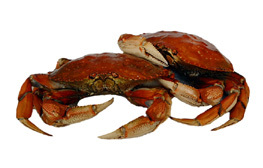 Request a wholesale quote for fresh Dungeness Crab today!